Note: General ATV Trail Guidelines are listed below. Step One: Identify the specific needs and or destinations of the trail. Is there a need for trails linking different destinations in your area? Is there a trail system operated by an ATV club in an adjoining town? Step Two: Identify potential trail corridor(s) and obtain maps of the proposed areas. Are there existing corridors* that can be used for this trail? Such as logging roads, abandoned railroad rights-of-way, power lines, or other corridors or recreational trails. Are their obstacles the trail should avoid? Such as bodies of water, tree plantations, wetlands, heavily populated areas, and areas with very steep terrain. Are there areas that require extra sensitivity to the impact of noise and nighttime activities on nearby residences, domestic animals etc. Computer-mapping programs and Global Positioning Systems (GPS) that are compatible. These combinations allow clubs to have very concise, accurate, customized maps. Mapping or aerial photo programs like Google Earth can help to identify possible routes corridors and obstacles. Identify the landowners over whose property the trail passes; both private & public owners. Emphasize that your request is for a corridor across their lands and that it will be built to the ATV Programs general ATV Trail Guidelines. Be prepared to revise your trail around landowners unwilling to give permission for use. Such refusals may require you to look for alternate routes. Be sure you understand their concerns completely. Never promise something you can’t do and follow through with what you agree to. Be prepared to compromise, and always be considerate of the landowners' rights. Consider volunteering to help landowners in return for permission to use their property. 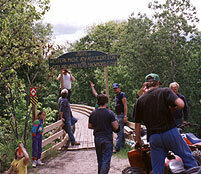 Throughout the process utilize the resources of the Bureau of Parks and Lands ATV Program. This becomes especially important if your path includes public lands of any type. It is often easier to obtain permission if a responsible public official is advocating for you. All trails must be established in accordance with State Laws pertaining to All Terrain Vehicles (ATVs) and the Off-Road Recreational Vehicle Office’s Motorized Trail Construction & Maintenance Manual (PDF 1 MB). Trails will be established only on land where landowner permission has been obtained. If written permission is unattainable, verbal permission will be accepted with a written affidavit from the ATV Club President confirming permission was obtained and the date it was obtained. Maintained to a minimum of 5 feet wide. Overhead = brush and limbs cleared to a minimum of (7') seven feet. Pass through variable terrain to hold interest and create a reasonable degree of challenge. Be maintained for safe operation of off road motorized vehicles, considering some operators will be less experienced than others. Avoid critical wildlife, ecological areas, and other areas of potential conflict. Be routed to avoid steep slopes. Sustained slopes should not exceed 30 percent. Precautions should be taken to eliminate erosion during and after construction. Be monitored on a regular basis in order to insure safety. Streams and rivers will be bridged in compliance with all environmental regulations. Bridges will be a minimum of (5') five feet wide and we recommend (8) eight feet wide for trails that are also groomed for snowmobiles. Crossing fords are allowed only if they are located on a hard bottom so as not to cause sedimentation and only if approved by the appropriate environmental agencies. Wetlands like streams are also protected and permits may be needed to cross them. Trails across wetlands will only be approved if the trail hardening techniques such as corduroy, turnpike, or puncheon are used to protect the soils. Railroad tracks can only be crossed where authorized by the railroad. Sign the trail following the established Off-road Recreational Vehicle Office’s ATV trail signing guidelines. Highway crossings should be at right angles to provide clear visibility in both directions. You can apply to have Department of Transportation install highway signs notifying traffic of the trail crossing (link?). This may be advisable in areas of limited visibility or heavy traffic.